It’s apricot time again, the season for another crate of apricots from Julien’s orchard, now officially organic. His first crop was ruined by hail, so mine are from the second, large deep gold fruits with a rosy tinge. I confess I still have lots of jam left from last year, and even a jar of apricots in vodka, so I only took 5 kg this time. Some of them were halved, stoned, and went straight into the freezer between layers of greaseproof paper. Some made yet more jam, and others were simply eaten. That left me with about a dozen, and looking for recipes I happened across Loulou’s clafoutis. I already have several clafoutis recipes, but Loulou’s looked so tempting I just had to try it. On closer inspection I was a bit worried by the oven temperature of 220C — I thought the eggs would curdle. So I did it at 200, but actually there is enough flour in it to prevent curdling, so I will do it at a higher temperature next time. This time, I just cooked it for longer. We usually eat clafoutis warm or cold, but Loulou recommends letting it cool completely, and she’s right; it was good warm, but the leftovers were even better straight from the fridge this evening. 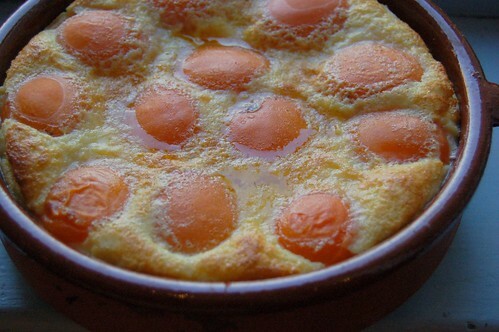 Like Loulou, I urge you to cook clafoutis; it’s so easy, and works with nearly any fruit, so you can do it all the year round, even with prunes in winter! Vary the flavourings according to the fruit — for example cinnamon with apples, or almonds with pears. These are my conversions of Loulou’s cup measurements. Butter a gratin dish about 20 cm across (I use one of those Spanish terracotta ones) and preheat the oven to 220C. Arrange the apricots in the dish cut-side down; they should cover the surface. Put the rest of the ingredients except the butter in a liquidiser or food processor and whiz till well blended, scraping the flour down the sides if necessary. Pour over the apricots, and dot with five or six small knobs of butter. Put in the oven and cook for 25-30 minutes until the custard is set and the top is puffed and lightly browned. Serve lukewarm or cold, with or without cream (I don’t think it needs it). It’s so tempting this recipe and also your apricot jam.